Seasons After Fall melds one of my least favorite genres, indie 2D platformers, with a genre I love, walking simulators, to create an all new hybrid exploration-focused 2D platformer experience that is right in my wheelhouse. Featuring the cutest little fox that has ever appeared in a videogame as the main character, and some spectacularly gorgeous graphics and music, Seasons After Fall immediately draws you in with its presentation and keeps you invested with fascinating season changing puzzle solving and exploration. It isn’t a challenging game, and there isn’t any combat, but it is a beautiful overall experience that players of the right mindset shouldn’t pass up. Continue reading our full Xbox One review of Seasons After Fall for all of the details. 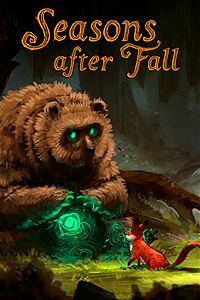 Seasons After Fall is the tale of a forest where a dark secret is lurking just out of sight. You play as a spirit that takes over the body of a wild fox and your job is to locate the four guardians of the forest that control the seasons so you can borrow their powers and use them to discover what is behind the pall of evil invading the forest. What sets Seasons After Fall apart from other similar experiences, like Ori and the Blind Forest for example, is that there aren’t any enemies or any combat or really any threats to you. It is purely an exploration and puzzle-solving game where the thrill of exploration and soaking up all of the natural beauty the game has to offer is where the enjoyment comes from. I’m personally a big fan of this type of experience – I love nature games like The Deer God or walking sims like Firewatch – but I am well aware it won’t appeal to everyone. 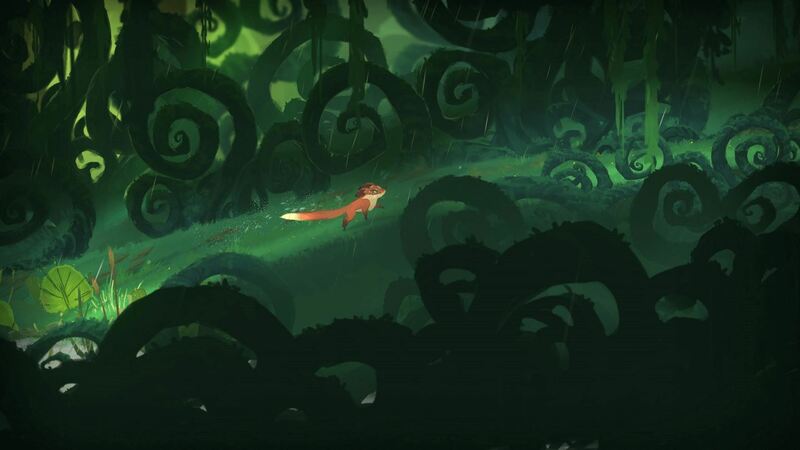 If you are one of the types of folks who can enjoy the simple pleasures of romping through a forest as a cute little fox, Seasons After Fall is a pretty fantastic 2D exploration game. The controls are very simple, just moving around with the left stick, jumping with the “A” button, and using the “X” button to make the fox yip and bark. Movement feels pretty good, though the fox turns around a tad slower than I’d like. The jumping and platforming isn’t super precise, either, but it doesn’t need to be. The real focus of the gameplay is using your collected powers of the seasons to change the forest around you in order to solve puzzles. Each season has different effects – winter freezes over lakes so you can cross them, summer lets you grow trees, mushroom platforms appear in the fall, etc. – and drastically changes the way you explore the levels. You can change seasons at any time and some puzzles require multiple steps / seasons to overcome, which is very cool. Nothing in the game is particularly challenging or taxing, but seeing the different ways you can use your powers to solve the puzzles never ceases to be interesting as there is a surprising variety to things once you get deeper into the game. My only real complaint is that, because there isn’t any real danger or enemies to worry about, having to backtrack through the same areas can be a bit of a drag. Once you get all of the season powers the game opens up in a sort of almost Metroidvania design where you have to criss cross back and forth the map to collect items in newly opened areas, and seeing the same stuff with no stakes causes the charm of bounding around as a fox between waypoints to wear thin after a while. Not a huge problem or anything, but something you’ll definitely notice. What really makes everything come together into something special in Seasons After Fall is the presentation. The visuals are absolutely fantastic and have a hand-painted look to them that is just awesome. The fox also looks great and is very cute, though I wish the animation was a little smoother and there was more of it as some of the movements are somewhat stiff. The music is also very, very good with a perfectly matched score and the little sound effects, particularly the fox’s yips, are excellent. All in all, Seasons After Fall is a beautiful and worthwhile experience that I thoroughly enjoyed. 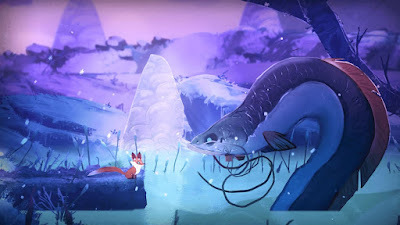 It likely won’t appeal to gamers that need action and excitement and enemies to kill, but if you can appreciate the serenity of nature and the simple joys of guiding a cute little fox through it, Seasons After Fall is well worth a look. I hate to say things like this, and I know indie devs hate hearing it, but the $20 price is probably a little steep, so maybe wait for a sale. It definitely deserves your attention when it reaches a price you’re comfortable with, though. Disclosure; A review code was provided by the publisher.